Well, it’s that time of year. 2015 is coming to an end and we are all getting prepared to ring in 2016! Tired of doing the same old things to celebrate New Year’s Eve and looking for something different? Well, look no further! Here are my top 5 unique ways to spend New Year’s Eve in Atlanta! Chick-Fil-A Peach Bowl – Football. Need I say more!? Your day will begin with the Chick-Fil-A Peach Bowl Parade. You’ll see floats, classic cars, cheerleaders, mascots, and marching bands! The parade begins at 8:00 am on Baker Street near the GA Aquarium and needs near the Georgia World Congress Center. Kickoff for the game is at 12:00 noon. Don’t have tickets? No problem, just head to TacoMac, Hudson’s, or The Nook to watch the game with other fans. After the game you’ll still have plenty of time to hit up some other awesome events going on around town. Noon Year’s Eve – Yes, you read that right, noon. As in 12:00pm. For those of you with kiddo’s that will not make it to midnight, celebrate noon year’s eve! Choose your celebration of choice at Lego Land, The Fernbank Museum, or The Children’s Museum. All with have celebrations geared towards your children! Tickets for these events sell out fast, so be sure to get yours today! Widespread Panic at The Fox Theatre – Who doesn’t love a good concert to ring in the New Year? And Georgia’s own Widespread Panic at The Fox Theatre, no less! The show starts at 9:00 and is sure to be a great time. 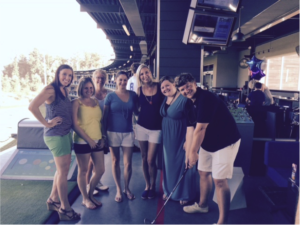 Top Golf – The Peter’s Co. LOVES Top Golf. So much so that we went as a team to play earlier this year (see picture below)! What an awesome way to bring in 2016! With the all-inclusive bay reservation, you’ll get unlimited non-alcoholic beverages, 1 bottle of champagne, New Year’s Eve party favors, and shareable snacks for you and your friends. They will also have a live DJ for your entertainment. National Beer Games – Oh yes, Beer Games. For $30, you get unlimited beer, pizza, and beer pong. There will be 16 competitive beer pong tables and 9 for those that “just want to have fun”. It will be a bracket style, double elimination system, so get your team geared up and ready to show Atlanta you are the best! There will even be cash prizes for the winners! The fun starts at 8:00, but get your tickets and team signed up now!